For information about Bonhoeffer’s own writings, see Exploring Bonhoeffer’s Writings in this issue. Here Dr. Clifford Green, professor of theology and ethics at Hartford Seminary, recommends books about Bonhoeffer. For a comprehensive bibliography, see Bonhoeffer Bibliography: Primary Sources and Secondary Literature in English by Wayne W. Floyd and Clifford J. Green (Evanston: American Theological Library Association, 1991). For information about scholarly publications and conferences, write: The Bonhoeffer Society, English Language Section, c/o Dr. Geffrey B. Kelly, Secretary, La Salle University, 1950 West Olney Avenue, Philadelphia, PA 19141. • Eberhard Bethge, Dietrich Bonhoeffer: Man of Vision, Man of Courage (New York: Harper & Row, 1970). The standard biography, by Bonhoeffer’s closest friend and editor; unrivaled. • Eberhard Bethge, Costly Grace: An Illustrated Introduction to Dietrich Bonhoeffer (New York: Harper & Row, 1979). A short biography, written about a decade after the previous one. • Eberhard Bethge, et al., eds., Dietrich Bonhoeffer: A Life in Pictures (Philadelphia: Fortress, 1986). An informative historical presentation through photographs—a great gift. • Keith Clements, A Patriotism for Today: Love of Country in Dialogue with Dietrich Bonhoeffer (London: Collins, 1986). Written by a British scholar in the wake of the Falklands War, it addresses a perennially vexing question. • Geffrey B. Kelly, Liberating Faith: Bonhoeffer’s Message for Today (Minneapolis: Augsburg, 1984). A fine introduction to Bonhoeffer’s thought. • Larry Rasmussen, Dietrich Bonhoeffer: Reality and Resistance (Nashville: Abingdon, 1972). 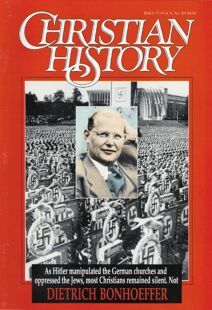 A scholarly examination of the theology and ethics informing Bonhoeffer’s role in the anti-Hitler plot. • Larry Rasmussen, Dietrich Bonhoeffer: His Significance for North Americans (Minneapolis: Augsburg Fortress, 1990). A collection of recent essays relating Bonhoeffer to contemporary issues; contains an essay on Bonhoeffer’s family by his niece, Renate Bethge. • Benjamin Reist, The Promise of Bonhoeffer (Philadelphia: Lippincott, 1969). An early but useful study. • Wolf-Dieter Zimmermann and Ronald Gregor Smith, eds., I Knew Dietrich Bonhoeffer: Reminiscences by His Friends (New York: Harper & Row, 1966). Brief, interesting portraits by friends remembering different stages of his life. Christianity and the Civil War: Did You Know? Little-known or remarkable facts about Christianity during the American Civil War. What PBS didn’t tell you. Headed for Heaven or Hell? How would Lincoln answer? His political opponent, a famous frontier preacher, wanted to know.